The Obama administration deported less than one percent of the nearly half a million foreign nationals who illegally overstayed their visas in 2015, according to new statistics published by the Department of Homeland Security. Of the 482,781 aliens who were recorded to have overstayed temporary U.S. visas in fiscal year 2015, just 2,456 were successfully deported from the United States during the same period, according to DHS's figures, which amounts to a deportation rate of around 0.5 percent. The sinking rate of deportations by the Obama administration is drawing criticism from Capitol Hill, where lawmakers are warning that the administration is ignoring illegal overstays and potentially opening the United States to terrorist threats. The 482,781 figure accounts for aliens who entered the United States on a nonimmigrant visitor visa or through the Visa Waiver Program, which streamlines travel between the United States and certain other countries. The figure encompasses foreign nationals who were found to have remained in the United States after their visas expired or after the 90-day window allowed by the Visa Waiver Program. The actual number of overstays could be higher. The latest figures published by DHS do not include overstays from other visa categories or overstays by individuals who entered the United States through land ports, such as those along the Mexican border. Deportations by the Obama administration have decreased steadily since 2009, according to figures codified by the Senate's Subcommittee on Immigration and the National Interest and provided to the Washington Free Beacon. Since 2009, U.S. Immigration and Customs Enforcement has expelled 51,704 individuals who overstayed their visas. The total number of those expelled has decreased every fiscal year. At least 12,538 illegal overstays were deported in fiscal 2009, while 11,259 were removed in 2010, 10,426 in 2011, 6,856 in 2012, 4,240 in 2013, 3,564 in 2014, and 2,456 in 2015, according to the committee. The drop is being attributed by sources to an Obama administration policy directing DHS and ICE not to pursue visa overstays unless the offender has been convicted of major crimes or terrorism. "The decision by the Obama administration not to enforce immigration laws by allowing those who have overstayed their visas to remain in the country has not gone unnoticed by the American people," sources on the Senate subcommittee told the Free Beacon. 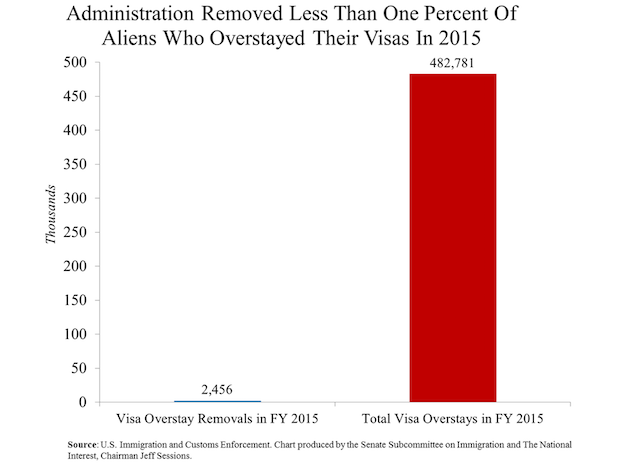 "A Rasmussen Reports poll released earlier this year indicates that approximately 3 out of 4 Americans not only want the Obama administration to find these aliens who overstay their visas, but also to deport them." "The same poll indicates that 68 percent of Americans consider visa overstays a ‘serious national security risk,’ and 31 percent consider visa overstays a ‘very serious’ national security risk," according to the sources. 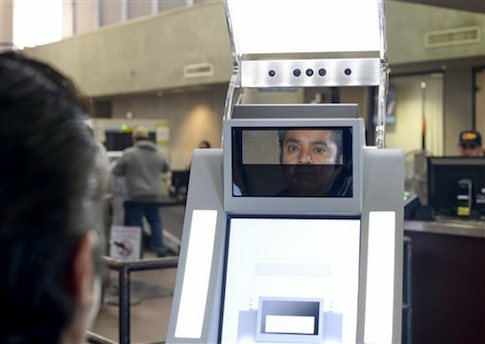 Congress has long mandated the implementation of a biometric entry-exit system to track individuals who overstay their visas and ensure they leave the United States. Sen. Jeff Sessions (R., Ala.), chair of the Senate’s immigration subcommittee, recently proposed an amendment aimed at speeding up implementation of this system. Senate Democrats blocked the amendment. Immigration and Customs Enforcement has received substantially more taxpayer money in recent years despite the plummeting rate of deportations. At least 43 percent fewer aliens were removed from the United States from 2012 to 2015, according to DHS statistics. This entry was posted in National Security and tagged Immigration Reform. Bookmark the permalink.